We are located in the heart of South Carolina. Enjoy our warm hospitality, mild weather, and beautiful grounds. Explore the local attractions. Whether its bass fishing or the ballet that tickles your fancy, a short drive will put you in the middle of the action. After a day on the lake or a night on the town, you can return to the quiet comfort of your secure campsite. It is our commitment to make your stay with us a pleasure. So come on over, kick your shoes off, and relax and we will do our best to make you feel right at home. Our Good Sam Park rating ensures that you will find our modern restrooms and showers are clean and well-stocked. Our grounds are free of litter and nicely manicured. 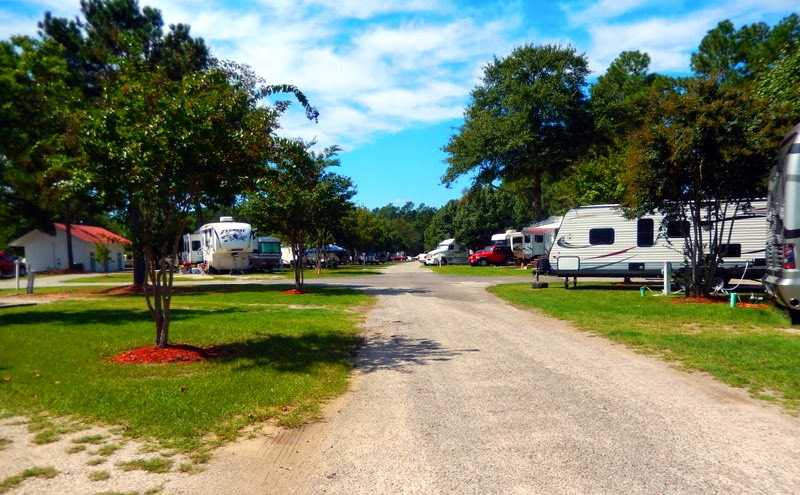 Our sites are level, spacious, and fully equipped. And our associates are friendly and helpful. We are confident that you will be pleased with our quality facilities. All sites include water, sewer, electric (30 and 50 amp), and cable TV. Most of our sites are pull through and can accommodate large units, including a tow car. Reservations are highly recommended.